Looking at patterns of employee growth (and decline) can reveal insights beyond revenue, profit or company valuations. For sectors that have a mix of incumbents (with solid revenues) and startups (less revenue but lots of funding), it can be an especially useful method of comparison. Recently, our research team peered into the hiring world of the international payments industry and studied data from LinkedIn. This follows from our previous analysis of the c-suites. 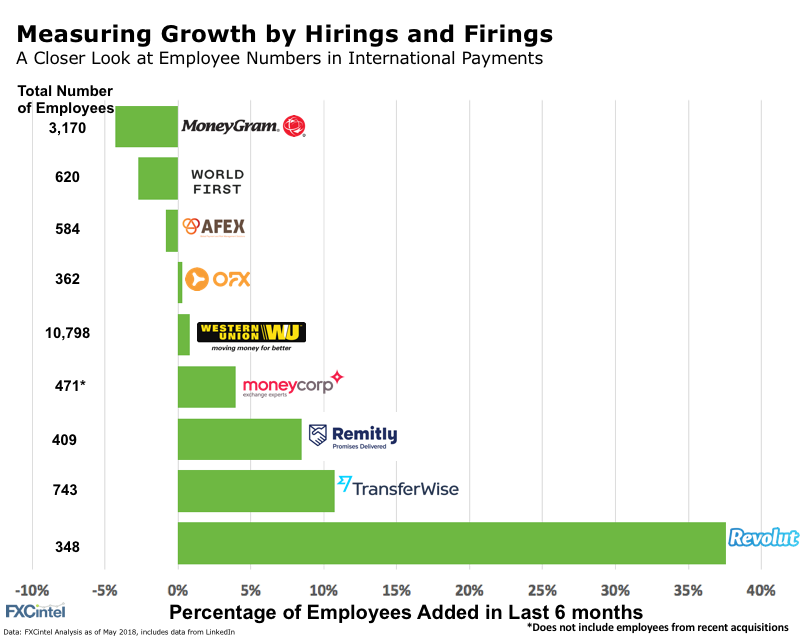 Analysing employee hirings can help point to the different models operating in the sector, from Revolut’s rapid growth to Moneygram’s lackluster performance of late. In most cases above, adding employees is required to drive top-line growth, though there are exceptions. For example, recently WorldFirst slightly reduced some of its headcount despite strong revenue growth over the last few years. This may be an example of a more established business focusing on its margins whilst at the same time rolling out a new product (its multi-currency World Account). Not every partnership works; and, sometimes they do not make it off the ground. Starling Bank, the UK challenger bank, which is in the process of raising a further £80m, has confirmed it’s going its own way on its payments business. The barrier for a company to set up its own cross-border product is now low, especially if that company is already regulated. RegTech is helping make the compliance part easier and liquidity in the core corridors is very much a commodity. That should mean some thinking caps are needed to come up with new ways to make a payments white-label stickier, especially when offered to other financial service companies. Another barrier that once existed has now come down.